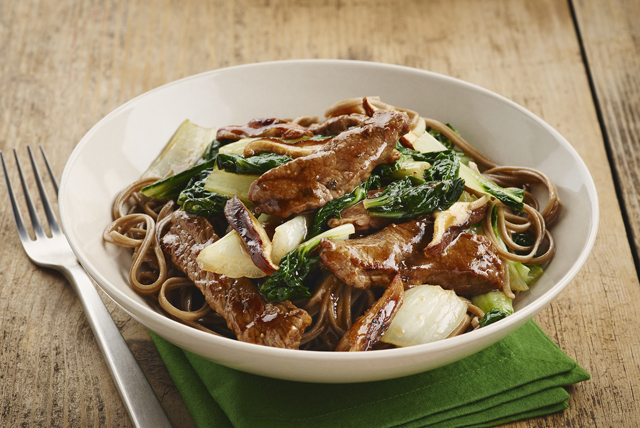 Beef steak strips pair up with mushrooms and bok choy in this quick and delicious stir-fry that gets the perfect balance of flavour from the balsamic vinaigrette dressing. Meanwhile, mix dressing and ginger until blended. Heat oil in wok or large skillet on medium-high heat. Add meat; stir-fry 2 to 3 min. or until lightly browned. Add vegetables; stir-fry 2 to 3 min. or until meat is done. Add dressing mixture; stir-fry 1 to 2 min. or until heated through. Freeze the steak about 30 min. before cutting into strips. The steak will firm up, making it easier to cut. Reserve the trimmed mushroom stems and use to prepare your favourite vegetable stock recipe.